Friday morning commuters may find slick conditions on the roads. A number of school systems in Maryland and Virginia are opening late due to the weather conditions. Here's what you need to know. WASHINGTON — Some rain and snow showers Thursday night have prompted a number of D.C.-area school systems to announce delays or closings for Friday, with the morning commute expected to be messy. Rappahannock County, Prince William County and Fauquier County public schools are closed Friday. Schools in Virginia’s Arlington County, Culpeper County, Spotsylvania County, Stafford County, Fredericksburg City and Alexandria City public school systems will open two hours late Friday. Schools in Maryland’s Anne Arundel County, Carroll County, Frederick County, Prince George’s County and Howard County public school systems will open on a two-hour delay. See the full list of school closures and delays. 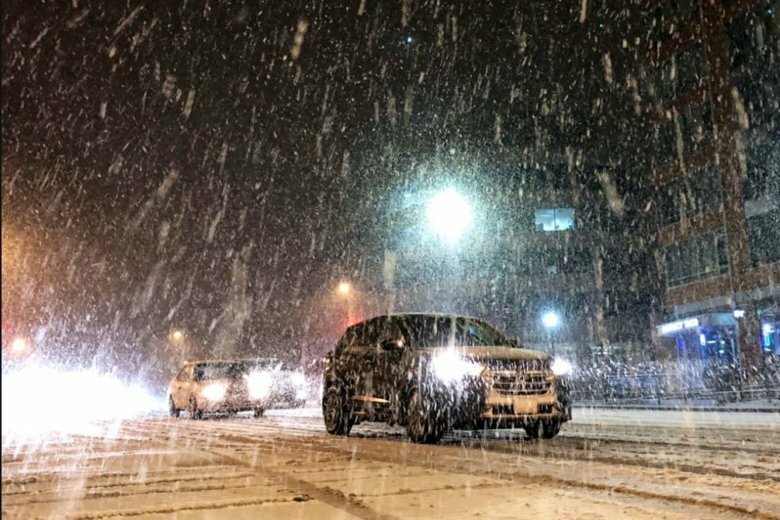 Drivers should expect “slippery road conditions and sidewalks” and hazardous conditions due to Thursday night’s wintry mix. Maryland State Police said they responded to 30 crashes and 14 disabled vehicles and also answered 386 calls for service from 7 p.m. Thursday through 7 a.m. Friday. Most of the snow flurries Friday morning were out of the way by daybreak. Remaining snow will exit by daybreak, but roads and sidewalks may still be slippery. “Throughout the day, some sunshine will develop with highs warming to near 50 degrees, melting a lot of snow, especially if we see more sun,” she said. Thursday night’s conditions came ahead of some wild weather this weekend: Heavy rain, a wintry mix and then a powerful blast of Arctic air will bring dangerously cold wind chill temperatures to the area. Saturday starts cold and dry, Storm Team 4 meteorologist Chuck Bell said. There’s a chance for some light snow that eventually becomes all rain late Saturday afternoon and steadier rain Saturday night into Sunday morning. Then, on Sunday, the rain may end with another “quick shot of snow” as bone-chilling cold air rushes back into the area. Temperatures in the 40s Sunday are expected to fall very quickly throughout the day, into the 20s by about 5 p.m. that afternoon and all the way down to near 10 degrees Monday morning. FRIDAY: Some sun develops and not as cold. SATURDAY: Cloudy with rain arriving later in the day. Wintry mix possible around the Mason-Dixon line, becoming all rain overnight. SUNDAY: Windy with rain ending possibly as a wintry mix, mainly of snow, Sunday afternoon. Frigid air moves in.